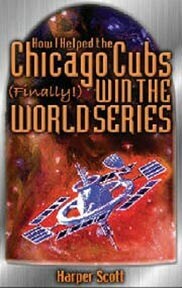 Cover for How I Helped the Chicago Cubs (Finally!) Win the World Series, a memoir by Harper Scott, from Aardwolf Press. This is my first hardback cover art. This is the description to Harper Scott's book, from the Aardwolf site: "The year is 2160. 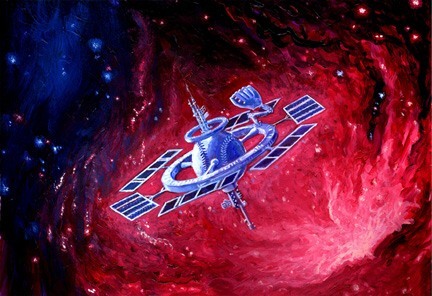 Interstellar flight is common, space stations are as busy as 21st-century airports, and extraterrestrials inhabit Earth. And the Chicago Cubs still haven't won the World Series since 1908. Fed up, two Cubs fans use a time machine to travel back to 1908, recruit (okay, kidnap) two players off the last championship Cubs team, and bring them to the future to help the Cubs finally win another World Series." Since Baycon 2005, this painting has been in a private collection. Also, feel free to visit Harper Scott's website.